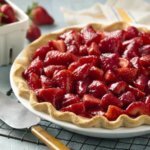 Why buy a strawberry pie when you can easily make your own? We are using a bought pie shell for this recipe so you don't have to make your own dough. However if you have a preferred dough recipe, you can use that. The topping is made with fresh strawberries along with cornflour, sugar, water and also strawberry jelly to hold everything in place. You can serve the finished pie with ice cream or whipped cream, and a sprig of fresh mint also makes a nice garnish for this dessert. 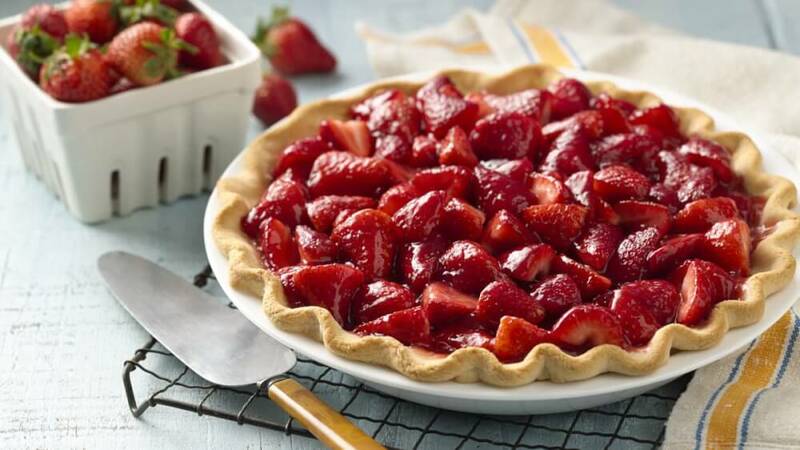 If you don't want to slice the strawberries, you can arrange them whole in the crust. Just have them pointed side up. Take this pie to a potluck supper or make it as a nice surprise for the family. You can swap the strawberry jelly for orange or another flavour if you want to introduce a contrasting fruity taste. 2. Line the pastry shell with 2 layers of heavy-duty tinfoil (don't prick it first). 4. Remove the foil and bake for another 5 minutes. 5. Let it cool on a wire rack. 6. Now put the cornflour, water and sugar in a small pan. 7. Bring this mixture to a boil and then cook for a couple of minutes, stirring, until thick. 8. Take the pan off the heat and stir in the jelly powder until it dissolves. 9. Chill it in the fridge for 20 minutes. 10. Arrange the strawberries in the crust and pour the jelly mixture on top. 11. Chill in the fridge until set, then serve, garnished with fresh mint if liked.